Who said you can't try scuba diving without a license? Well, if you're interested but are not yet sure if you want to make the investment, why not go for an intro dive? And that's what we did! 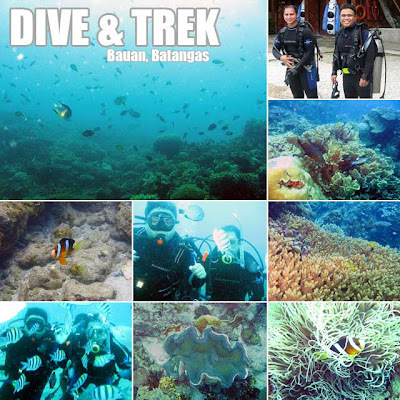 We trooped to Bauan, Batangas to check out the life underneath the water at Dive and Trek Resort. An intro dive is an opportunity for non-divers to experience diving and see for themselves what's actually down there. And you do it with a dive master who takes you around for about 30 minutes. All you do is relax and enjoy the view and the dive master will push you around the coral reefs. And if you like what you see, then you take the next step and get yourself a license! 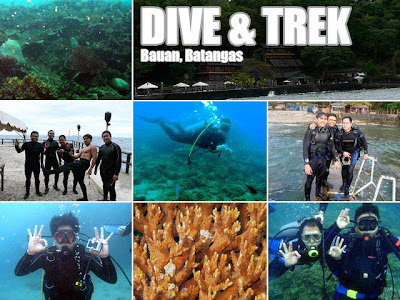 The fastest way to Dive and Trek is via Tagaytay, and the towns of Lemery, Taal and San Luis, Batangas. Just a little over two hours from Manila, it's a really convenient drive down south. There is a designated parking area at the end of the road, just look for the sign. And from there, a pump boat picked us up to take us to the resort. I've been extra lucky since this was my fourth straight sunny weekend in between typhoons. We booked our intro dive through Green Goose Adventure Tours and it was really worth it for a dive! Packages start at PHP2300 per head, inclusive of gear, use of the resort, buffet lunch and merienda. Anyway, we went down two by two since there were two dive masters available. But since we had licensed divers in our group, they joined us as well. Marveling at the different species of fish, corals and other marine life forms was a really great experience! After the thirty minute dive, I rested a bit on one of the lounge chairs before heading to lunch. And lunch did not disappoint! Since our dive master was a classmate at the Ateneo, I asked if we could go down one more time after lunch and we did! It looks like I'll be getting a diving license in the near future since I definitely enjoyed it. But maybe after all my international trips this year. On the way back, we experienced turbulent waters but it was not too much a hassle. Before returning to Manila, we had dinner at Mano's Greek Taverna in Tagaytay. Wonderful food! I'll talk about it in my next blog entry. btw do they provide underwater picture shots for those of us without waterproof cameras? My mom's family is from Bauan. I used to go there often during the summer school breaks. But I never knew there was a dive resort there. Thanks for posting this. Next time I go home, I'm definitely going to check this out. I did a discovery dive (it can be called that too) in Coron last April and it was great! 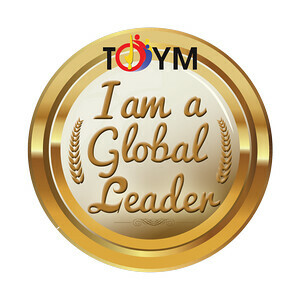 That really encouraged me to do a real course. Hi guys! Sorry for the late response. I've been on the road and still traveling. @kiko, you'll have to bring your own camera. @traveler on foot, nothing beats the view down under! @vj, it's quite near to Anilao. We can see Anilao from the resort. @jeanbantolinao, wow! I want to go to Seychelles too! @cathy, thanks for the info! I wonder when I'll get my license. this is very interesting! is there a direct number where i can contact these guys, that is, no agency involved? thanks. 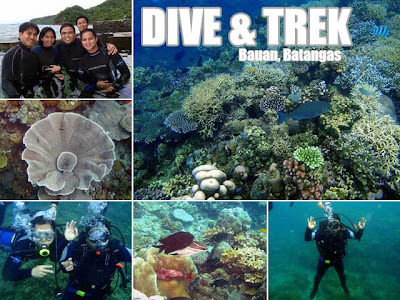 We love Dive n TRek. We did adventure dives there many times. My husband and daughter has license already so we can go under just us. The resort is realxing. When you go underwater at Dive n Trek even if its intro bring left over bread. It is fun feeding and playing with different species of fish that you forgot time. Just don't forget to check your air. We usually take the Anilao Parking Lot when we go to Dive n Trek. Good place for overnight stay too.